On one of the burgeoning commercial corridors of downtown L.A.’s Arts District, blocks away from the homelessness of skid row and the sewing machine-filled factories of the Fashion District, a start-up is trying to bridge these disparate worlds. It’s not an app or a social network or an underfunded nonprofit but a shoe company called Comunity. The new headquarters and showroom feature the company’s handcrafted shoes, which are manufactured by local craftspeople and sold directly to consumers both in-store and online. A portion of the proceeds is donated to organizations working on some of the city’s most entrenched issues, from homelessness to poverty to underserved schools. As the name suggests, Community aims to use business as a local force for good. Concern, a social services agency that helps people transition out of homelessness and poverty; Youth Mentoring Connection, which pairs at-risk youths with adult mentors from the community; and Street Poets, which uses poetry and music as tools for encouraging expression in schools and youth-probation programs. Few blocks southeast and across the L.A. River from Comunity’s showroom, eight cobblers sit at a wide worktable, hammering soles and stitching strips of leather as they finish up Comunity’s most recent orders. They’re part of the 85-person team at Lalaland, a shoe and handbag factory that works with small direct-to-consumer brands like Comunity as well as global brands. 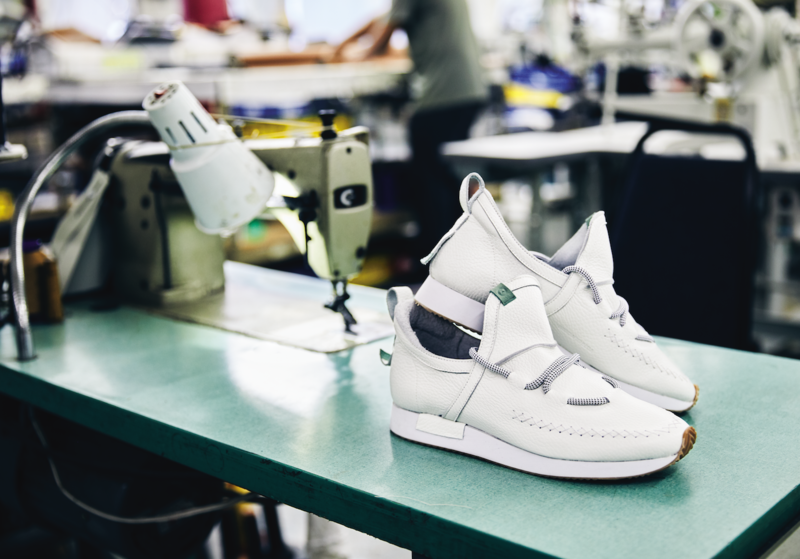 Lalaland has put together more than 3,000 pairs of shoes for Community so far, with employees laboring over the intricate hand-stitching and embossing HAND CRAFTED IN DTLA on each instep. The Scotts and Gumienny were attracted to Lalaland because of its focus on handmade manufacturing processes. “We feel very strongly about rebuilding the manufacturing industry in the U.S.,” says Shannon. They also liked that Lalaland pays workers a living wage—an average of $14 per hour. “The labor is the most expensive cost of our shoes,” Sean says. “That’s how it should be.” He argues that cheap overseas labor has distorted consumers’ perceptions of what it takes to create a high-quality product. Lest anyone think twice about where their money is going when they buy a $180 pair of shoes from Comunity, the company breaks down the pricing on its Web site. Minus the $10 donation, another $10 for shipping and packaging, and the company’s $81 revenue, each pair of those shoes costs $79 to manufacture, including materials and labor—about three times the cost of a similar product produced in Asia. This article is a part of Give Los Angeles 2017: A Charitable Registry. Click here for more.